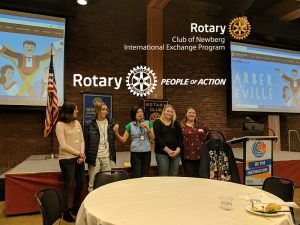 The main topic of the meeting was an update from two of the international Newberg Rotary exchange students. 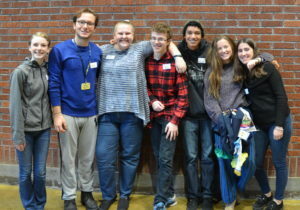 Exchange students, left to right: Anna Hinkle, Nevres Eryigit, Kathryn Lawson, Eric Myers, Ian Kirschner, Danielle Bosse, and Clara Perez Rossi. Kari Fahrenkopf, from the Morning Club and one of the administrators of the exchange program, introduced the students: Clara Perez Rossi, a long-term from Argentina; Nevres (“Just call me John”) Eryigit, a long-term from Turkey; Kathryn Lawson, a short-term who went to Germany last summer; Danielle Bosse, a long-term who went to Argentina last year; and three new recruits: Ian Kirschner, planning a long-term to Japan; Eric Myers, planning a long-term to Germany and Anna Hinkle, planning a short-term to Italy. Danielle in her special jacket and pants. 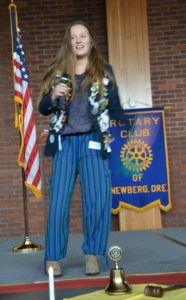 We heard first from Danielle, decked out in a jacket with the pins the exchange students traditionally collect, and some unique pants she got at a flea market in Argentina. She lived there for almost 10 months last year. She stayed with two different families, and went to a small private school. 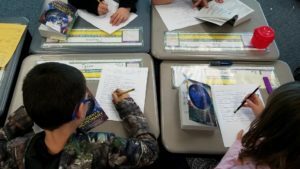 She said the school experience was different from Newberg because the students stayed in the classroom and the teachers moved around. She lived in the town of Reconquista, located on a river with “tons of palm trees.” Early on, a tropical storm surprised and scared her….until she found out it stormed every single day without fail. She took “thousands of pictures,” and made lots of new friends. Danielle said food is one of her greatest loves. “Here I am a vegetarian, but there I wasn’t,” she giggled. “If you have an opportunity to eat beef from Argentina, definitely take it.” She also liked a special type of ice cream similar to dulce de leche and mate, “like a tea you drink out of a gourd. It’s a very traditional Argentina drink, and people sit down for hours to talk over mate,” she said. She is planning to go to college and hopes to study abroad again. 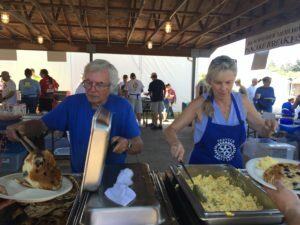 She closed by thanking Rotary for the experience she was able to have. 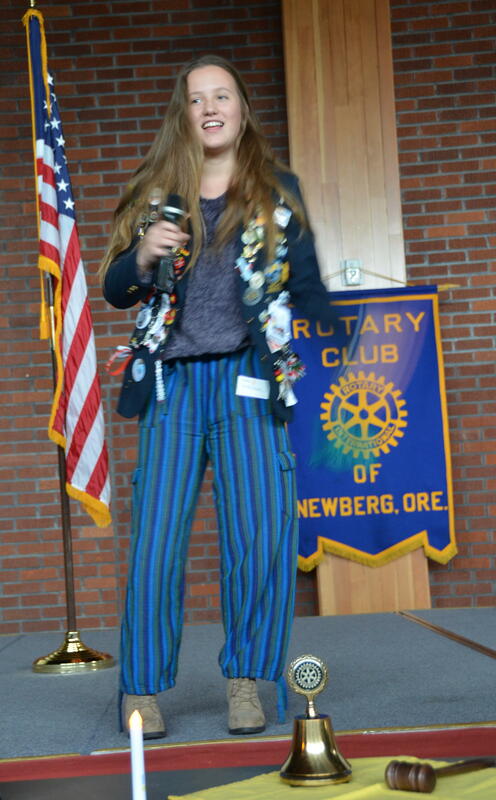 Kathryn was acknowledged for raising $2000 for her trip by recycling bottles and cans. Amazing! “My biggest dream was to visit a castle,” she said. So her host family took her to 4! “My favorite was Neuschwanstein in Bavaria because of the history there.” They also crossed the border into Austria “for about 5 minutes” so she could say she went there. She showed lot of photos– of the castle, the many churches she visited, even city mascots. Food was important to her, too. She was able to visit the Rittersport candy factory, and her favorite food turned out to be Doner, a pita with lamb and garlic sauce. In fact, she had it as her “last meal” before leaving Germany. Kathryn also plans to go to college and is interested in a career in government. She likes history and would like to go back to Germany. Club member Jack Czarnecki is recuperating from brain cancer surgery at Marquis Newberg on Werth Rd. He reports he is “feeling a lot better now.” He has undergone chemo, and is getting “intense physical and occupational therapy.” Jack said he believes he still has quite a bit of rehab time ahead, so he said to say “hi” to everyone. He appreciates the visits he has had from club members, and would welcome more. Looking forward to the time we can welcome you back and wishing you a full recovery, Jack. This year’s tree awaiting the official lighting ceremony. Ralph Koozer and Kari Fahrenkopf were among the volunteers staying after the meeting. It’s finally here! The Holiday tree lighting event is this Saturday, Dec. 2. 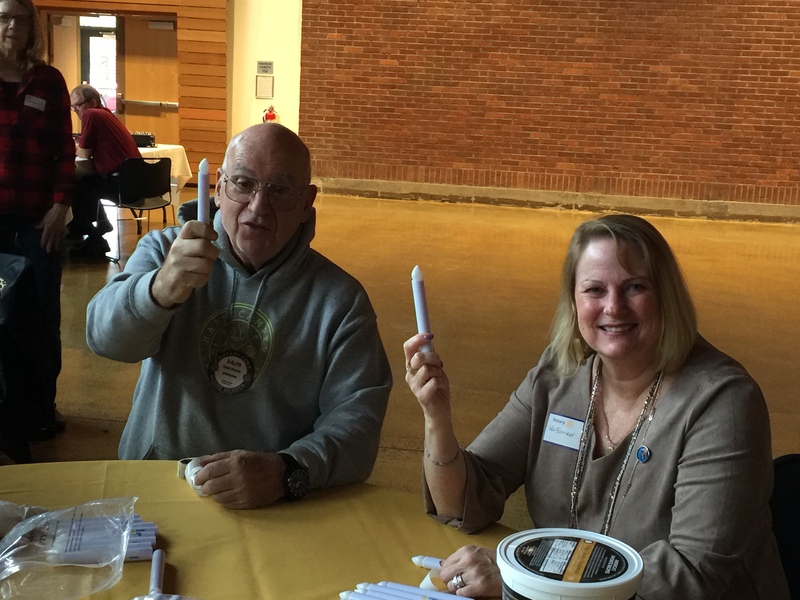 A number of volunteers stayed late after the meeting to help put stickers on 714 candles to be used at the event. “The candles were a hit last year. 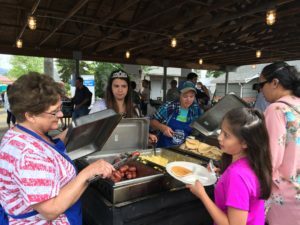 The kids like them and they add an element of magic,” said Past President Leah Griffith. Festivities start at 3pm. Denise Bacon, left, Becky Ankeny and Auggie Gonzales look up from sticker-ing candles. Kari Fahrenkopf invited us to attend the holiday auction at the Dec. 7 meeting of the Morning Club. Join them from 6:30 to 8:30am at the Cultural Center for this event to raise money for the student exchange program. The Rev. Dr. Martin Luther King, Jr. holiday event will be January 15 at the Cultural Center. Doors will open at 5:30pm, with the program from 6 to 7pm. The theme this year is “Be the Dream.” A reception and “invitation to action” will follow. Guest Kiwanian Lionel Muthiah was acknowledged for being one of the founders of this event. Paul Jellum announced he is going to be a grandpa again…..for the 17th time! Paula Radich said she made the jello, while her mom, who is turning 99, chopped and prepped the Thanksgiving dinner dressing. Seems like there might be something wrong with that picture! Many questions were asked–in fact, there’s not enough room to include them all in this summary. 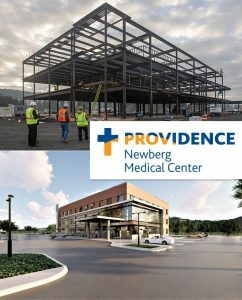 Like: How large is the Latino community in Newberg? Rosa said that as of 2015, Latinos make up 12% of the population. That population breaks out into Mexican, Puerto Rican, Venezuelan, Nicaraguan and other Hispanic nationalities. Like: How has that number changed over the years? Rosa offered to share reports with lots of historical nformation on this. She said one of the biggest changes is that the population is not so migratory now and immigrants are settling down. Like: What does “Latinx” mean? Rosa explained that Spanish is a very gender-specific language. The “X” is to express recognition of the LGBT community. 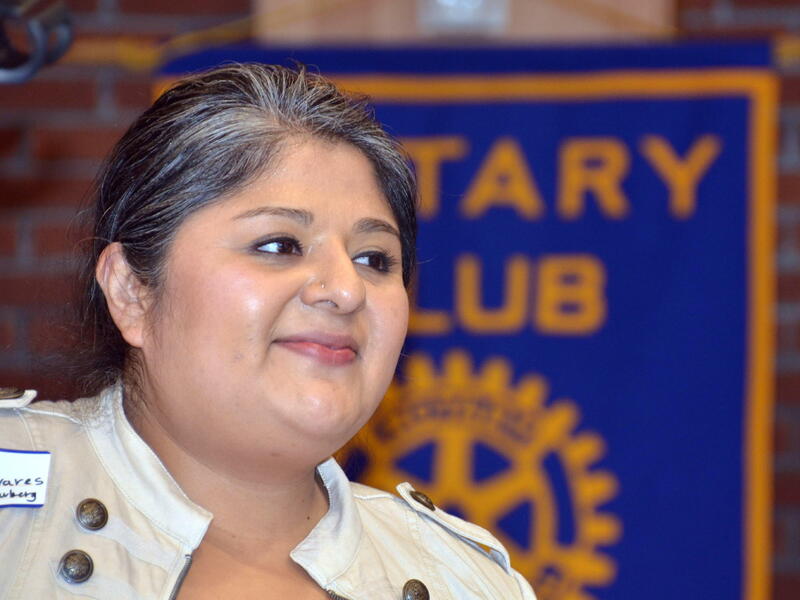 Like: How can Rotary engage more with the Latino community? Participate/engage. She suggested that Rotarians “go where Latinos are.” Be present at their activities. Be a volunteer. Be visible. She also suggested participating in the Chehalem Cultural Center’s Latino Heritage Month activities. When planning an event or something, think bilingual. Maybe do part of the programming in Spanish. Like: How many Latino-owned businesses are there in Newberg? Rosa initially thought there might be about 6, but group discussion took the number higher. 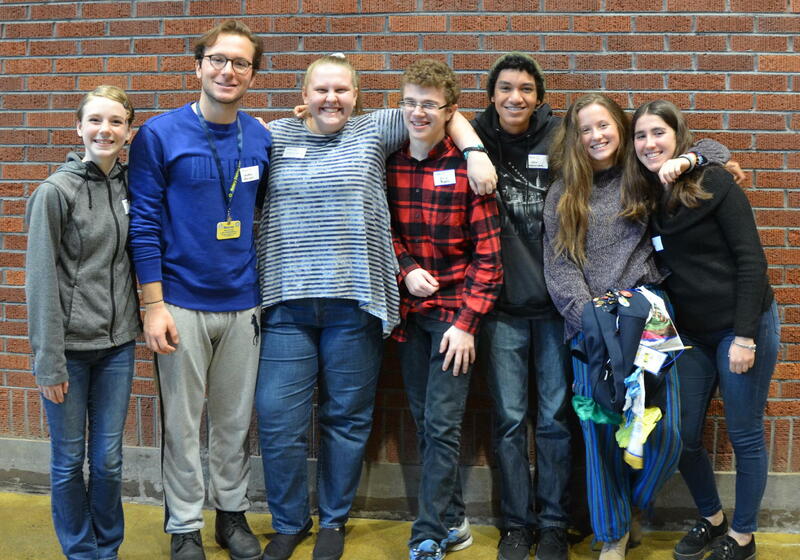 Like: What are the needs of the Hispanic community in Newberg? Rosa said there were three big ones: housing, access to education, and healthcare. She urged Rotarians to find ways to get involved with any of these issues, especially education by working with DACA students. Note: The Deferred Action for Childhood Arrivals, or DACA,was an American immigration policy that allowed some individuals who entered the country as minors, and had either entered or remained in the country illegally, to receive a renewable two-year period of deferred action from deportation and to be eligible for work. Rosa also gave some historical perspective on Mexican in-migration. She said that during World War 2 there was a shortage of agricultural workers because of Americans’ involvement with the war effort. So Congress created the Bracero program, and mostly men migrated to the U.S. to do seasonal work. These days, it is much more common for an entire family to move. Past President Leah Griffith introduced Rosa. She said they first met 12 years ago when Rosa was hired as the Library’s Latino Services Director. 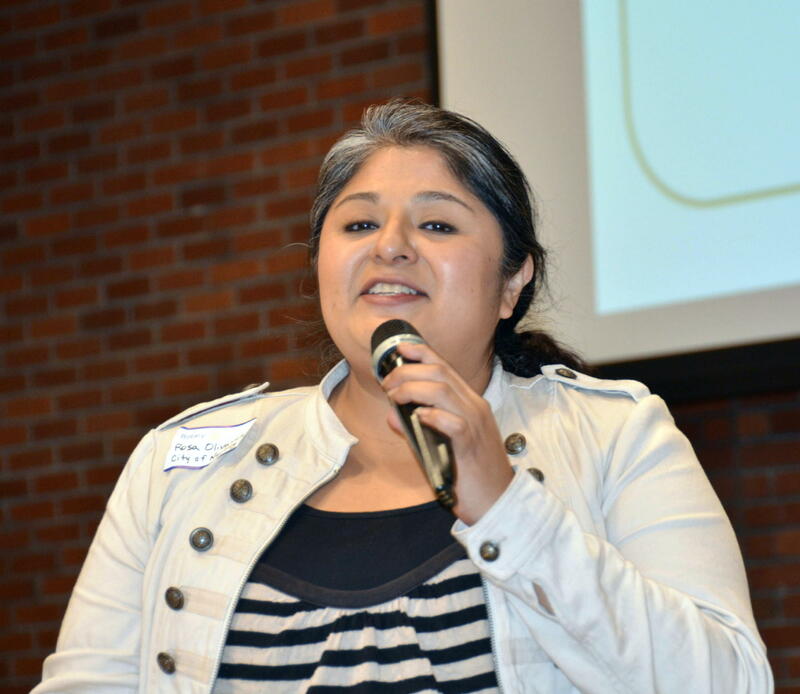 Rosa is a grad of Oregon State and has an MBA from Willamette University. “She developed the ‘Dia de Los Muertos’ celebration with the Cultural Center and has really made a connection with the community,” Leah said. Then the City decided to have a community engagement specialist and hired Rosa. Rosa ended with recommended reading, and has since sent me links to many of the reports she referenced. If you would like any of them, please email me. Jake Ramirez from Water Bear attended, and was a valuable contributor to our meeting topic. Spike Sumner introduced Ken Winder as his lunch guest. Dan Keuler’s wife, Lydia, and baby son, Jackson, were able to join Dan for lunch again. Leah Griffith sent this photo of school kids using the new dictionaries supplied by our club. Thanks to all who volunteered with this project. It’s not too late to donate a turkey to a family in need. Tony Lelack is again coordinating this effort through Excel Fitness. If you can, please drop off a 15-lb. one (feeds a family) there. 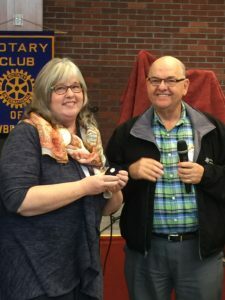 Ann Dolan now has the distinction of being accepted as the club’s first-ever “Friend of Rotary.” Congratulations and welcome, Ann. Dec. 13 is the date for the upcoming election of club officers. 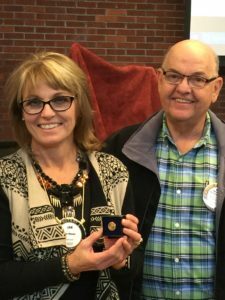 Rotarians who wish to nominate themselves or others for officer or director positions for the 2018-19 Rotary Year should submit nominee names to Paula Radich no later than Wednesday, December 6th. Note: If a Rotarian wishes to nominate a fellow Rotarian, the person who is nominated should agree to have his/her name placed on the ballot. Oh, thank goodness! Now maybe some of us can get some sleep again. Past President Leah Griffith announced that plans are well underway for the Holiday Tree lighting event on Saturday, Dec. 2 in the Cultural District. It’s way more complicated than you might think. The City Public Works Dept. secures a tree, and PGE installs it. CPRD is in charge of making sure it is secure and standing straight, and TVF&R is in charge of installing lights. The Interact Club will help decorate it. Leah said she ordered 900 electric candles to hand out to kids, as they were a big hit last year. Festivities will get underway at 3pm on the 2nd; Santa arrives at 5:30pm. A holiday craft fair and a kids craft sale are also planned. 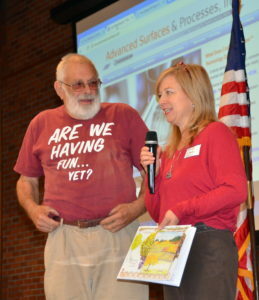 Rick Kaufman and his daughter, Kimberly. “It’s kind of my philosophy,” he said. And it sure seems to be. Rick is one of those people who has a lot of interests and never seems to get bored. He started his talk by introducing his daughter, Kimberly Howell, a U of O grad and artist who has designed a fun coloring book for Stoller Vineyards. It is for sale in their tasting room. She is the oldest of Rick’s two children. His son lives in Vermont. Born in 1939 in Portland, Rick was one of 5 children. 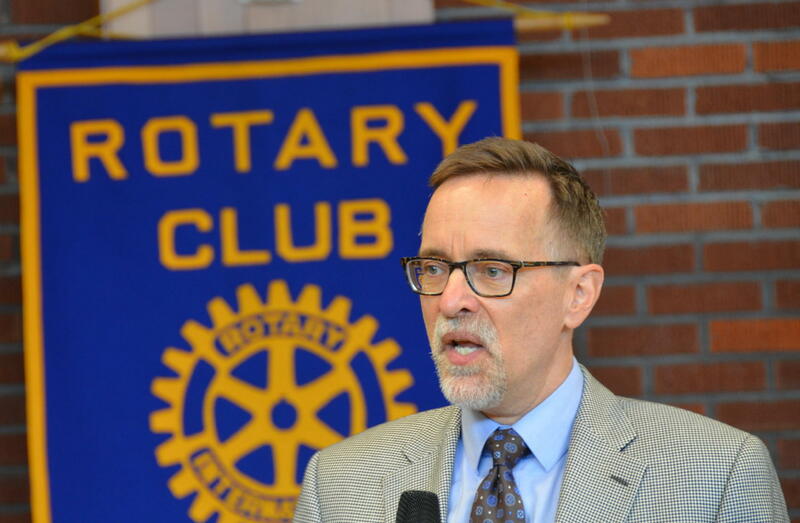 His father was one of the founders of Tuality Hospital in Forest Grove, and Rick’s ties to Forest Grove go deep. Rick went to Willamette University and to Stanford, and became a dentist. He also studied languages — Latin, Japanese, Russian, Spanish. 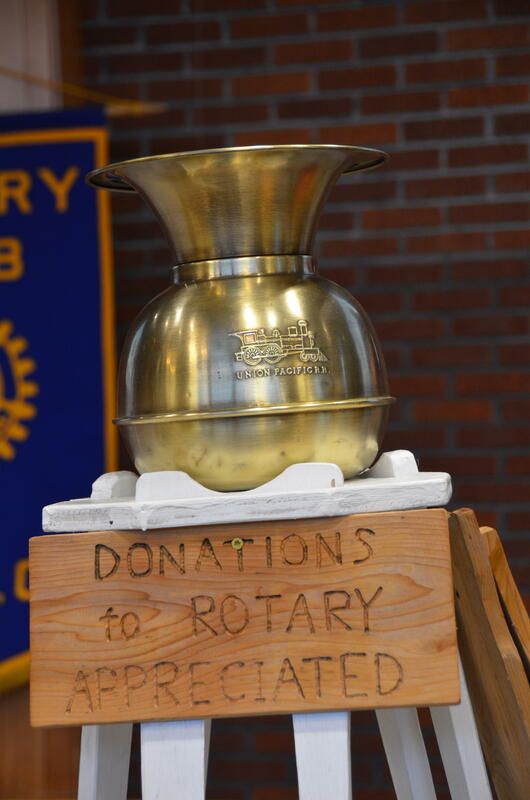 Rick’s gift to our club–a “Donations” spittoon and stand. He was forced to retire from dentistry due to a hand disability. “They don’t teach you in dental school what to do when that happens,” he said. “So I started over.” With a buddy, he started a company–Advanced Surfaces and Processes, Inc.” or “ASAP,” specializing in cold nano-fusion alloy technology. This technology is useful for industrial blades. Rick gave some examples of its application on Rolls Royce turbine engines, on a whole log chipper in the pulp and paper industry, and in the biomedical field. Rick also mentioned his woodworking hobby, and had some samples of his handiwork on display. Then, he just happened to pull out a trombone and said, “If you don’t toot your own horn, someone will use it as a spittoon!” He announced he was donating something he made to the club….a wooden stand holding an actual spittoon to collect donations. “It’s clean,” he joked. He also offered to donate the proceeds from the sale of wooden “yard sale” signs to the club, and to do custom wood projects. “Just don’t hold me to a deadline,” he said. 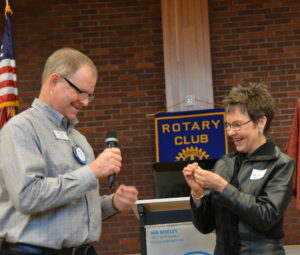 President Todd Engle presents a membership pin to Beth Pent. Beth Pent, certified pre-planning consultant with Attrell’s, became an “official” Rotarian last week with her formal induction into the club. Originally from Colorado and Wyoming, Beth enjoys living in the Pacific Northwest. She loves to cook and bake, especially using fresh, local ingredients. She also likes biking and hiking. 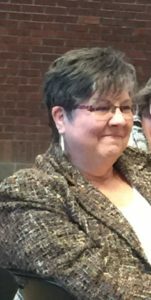 Congratulations and welcome, Beth! 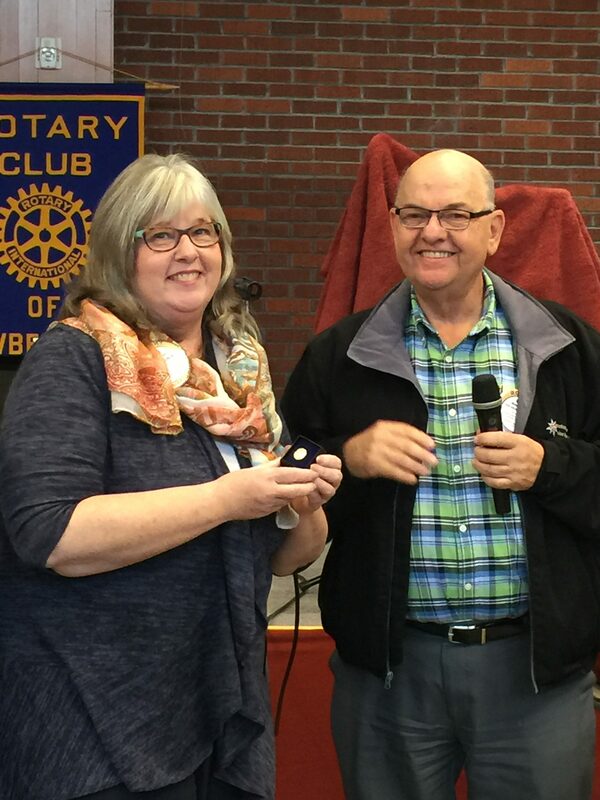 Jan Winder accepts a pin from PDG Mike Caruso. 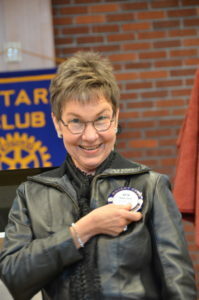 Past President Leah Griffith shows off her pin. 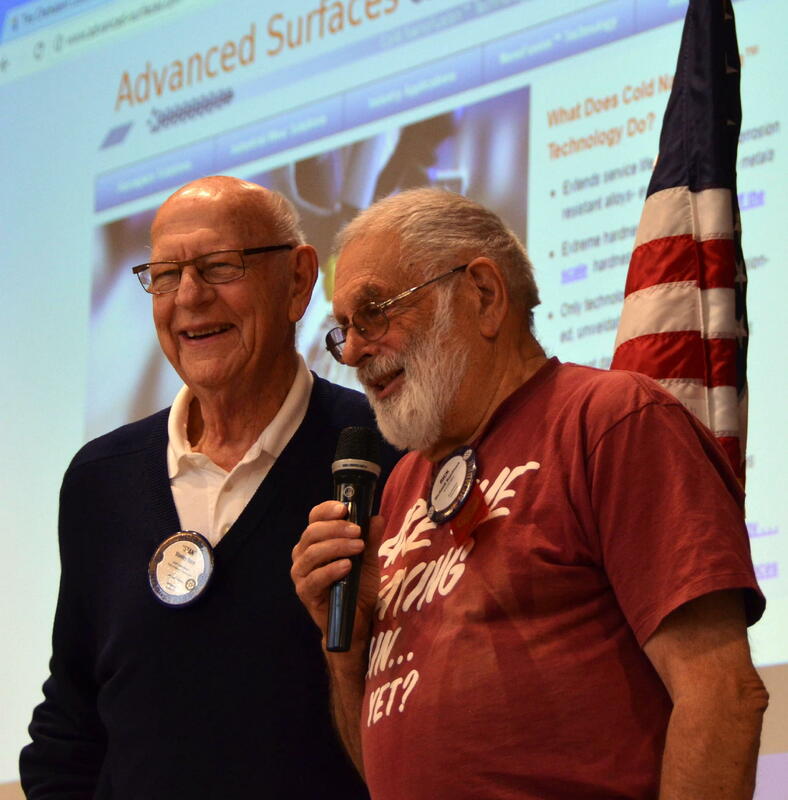 PDG Mike Caruso reminded us that the Paul Harris Society was formed in 1957 as a way to honor the founder of Rotary and to do good in the world. He recognized some of our club’s members who have given $1000 or more. 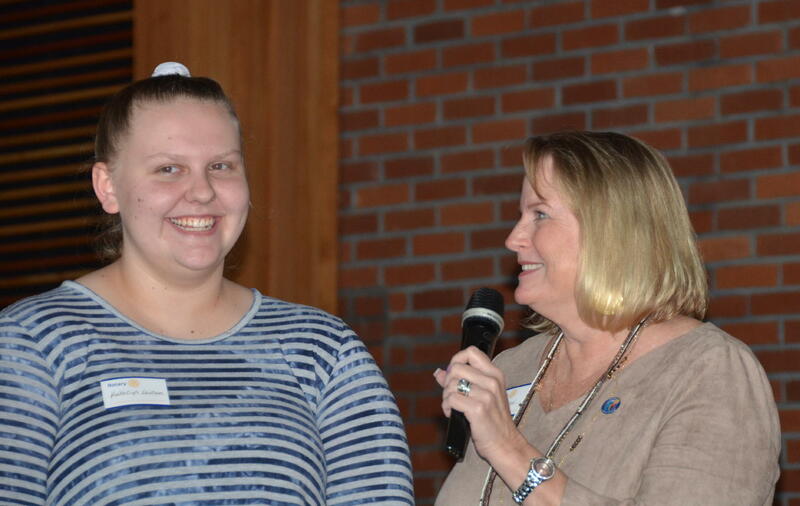 Jan Winder, left, accepted a pin, and Past President Leah Griffith also received recognition. Laura Tilrico was unable to claim her pin as she is still on a cruise to Hawaii. Lots of visitors last week! Cathy Davis, left, senior pastor at the United First Methodist Church in Newberg, was the guest of Denise Bacon. Visiting Rotarian and president of the morning club, Gary Stewart, paid us a visit. Newly inducted Beth Pent introduces her guest, Bret Chambers. Bret Chambers with Attrell’s was the guest of Beth Pent. Terry Weldon brought his 11-year-old daughter Isabella to lunch. Sherri Colon with PNW Relief for Puerto Rico was a guest of Om Sukheenai. PDG Mike Caruso was accompanied to lunch by his wife, Amy. 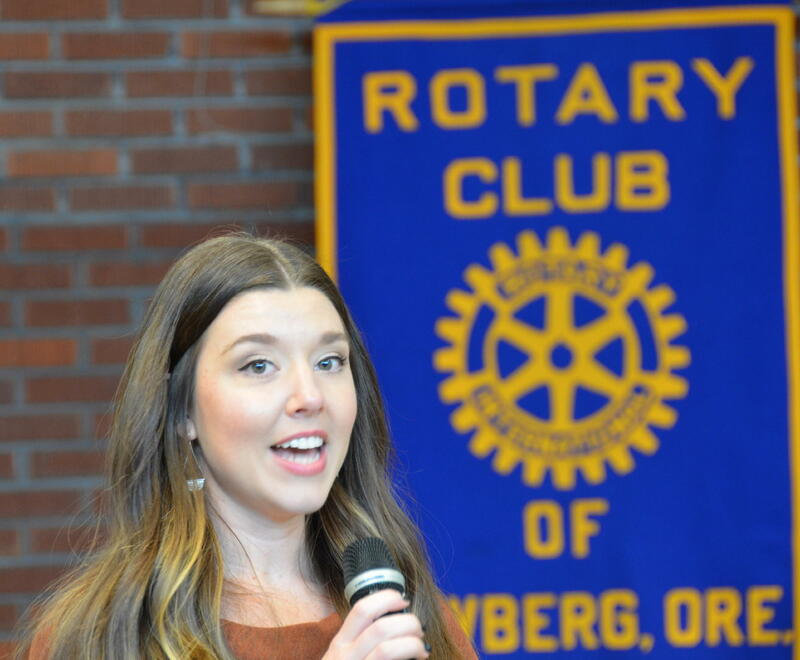 Shannon Buckmaster, who has embarked on a career as a professional speaker, has an upcoming engagement in front of the George Fox University student body. Congratulations to Shannon. 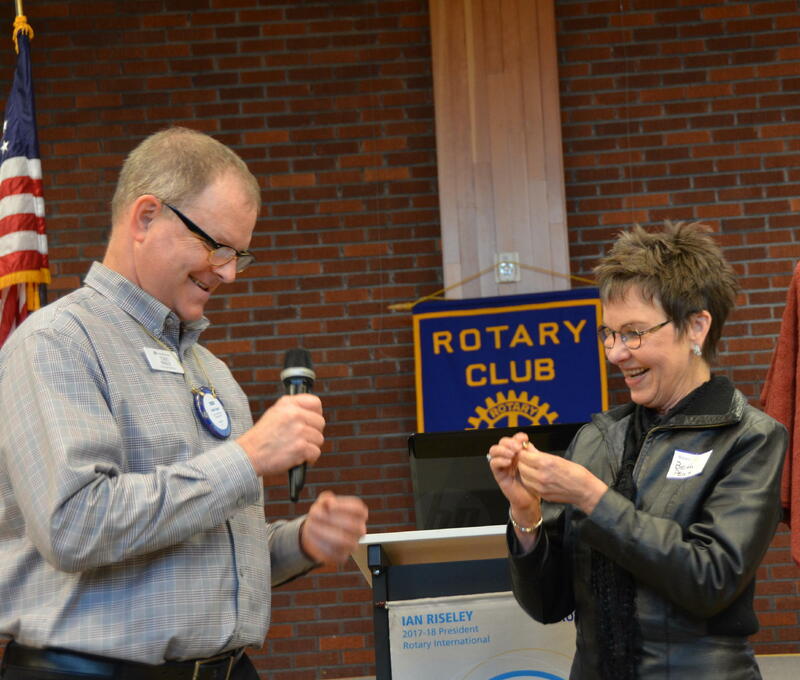 Bill Dolan said his wife Ann has turned in her application to become a “Friend of Rotary.” Great news, Ann. Fred Gregory announced that he is taking a road trip with his wife and will miss some upcoming meetings. Safe travels, Fred. Students at Mountain View Middle School check out the products available in the new Resource Room. 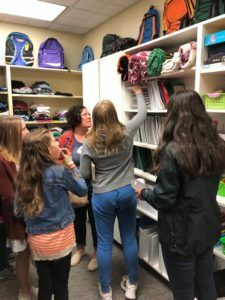 Jeff Lane reported on the grand opening of the Resource Room at Mountain View Middle School. The room and its wide selection of products were introduced to students last Monday. Volunteers are still needed. If you are interested, please contact Jeff. Dave Parker reported his daughter, Ellie, was voted as an Honorable Mention in the Northwest Conference, which is Division 3 Volleyball. She led the conference in Assists per Set, and was 4th in the nation in Assists per Set– this was with 250 Division 3 schools. Congrats to Dave and Ellie! Thanks to Paula Radich for her work organizing the recent vote on the club Constitution and Bylaws amendments. All of the proposed changes passed. 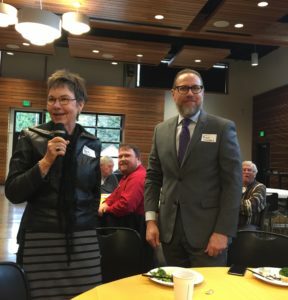 So began an informative update of the Oregon Health Insurance Marketplace provided last week by Michael Morter, agent and small business liaison for the organization. 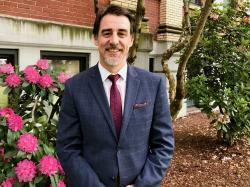 Michael Morter discusses the Health Insurance Marketplace in Oregon. According to Michael, “Senate Bill 1 restored full legislative oversight and control to state government. Since July 1, 2015, we report quarterly to the state Legislature.” Among the division’s responsibilities are oversight and administration of various insurance programs, and agent and small business engagement. Michael said they are working hand-in-hand with industry and stakeholders, including agents, insurers, the IRS, etc. You’ve probably heard of “Healthcare.gov.” That is the information technology platform now used by the Marketplace to determine eligibility and do enrollment in insurance plans. The Individual market has also seen higher than expected health care costs, contributing to large losses for insurance companies and significant rate increases. Some insurers are leaving the market or parts of the state. In the “Group” market, rate levels are more stable, he said, but the size of the market is now in flux. The national advertising budget was cut from $100 million to $10 million in Sept.
Michael said new products are being offered, such as short-term medical plans and coverage -specific plans (such as cancer-only, for example.) Both of these typically exclude pre-existing conditions. 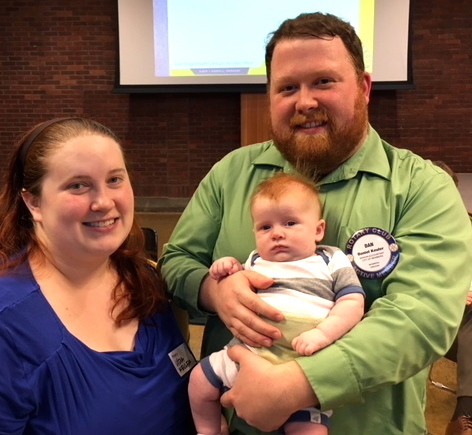 It was a family affair last week when Dan Keuler (below) brought his wife, Lydia, and just-about-two-months-old son, Jackson, to our meeting. 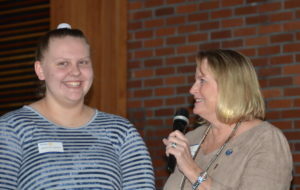 Kaitlyn Ragan (below) from the Idea Center at George Fox University was the guest of Geoff Gilmore. She visited to ask for volunteers to help students with a mock interview event on Nov. 20 at noon. Help is needed for only one hour to pose provided questions to the students so they can practice to secure possible internships. Paul Jellum volunteered last year and said it’s easy! If you can help, please contact Geoff. Marge O’Connell brought her neighbor and best friend, Velda Mitchell. Beth Pent from Attrell’s was in attendance and will be inducted into our club this week! Welcome, Beth. Jake Ramirez from Water Bear also joined us. Greeters are needed for future meetings. Please email Leona Todd or sign up at Wednesday’s meeting if you can help out. Wish I had a photo of Denise Bacon organizing everyone in attendance last week to send a “selfie video” to Jack Czarnecki. Jack is recovering from brain surgery at Marquis Rehab in Newberg. Wishing you a speedy recovery, Jack! You must check out the library’s display of Gertrude the Penguin. It’s located across from the main entrance to the Cultural Center. 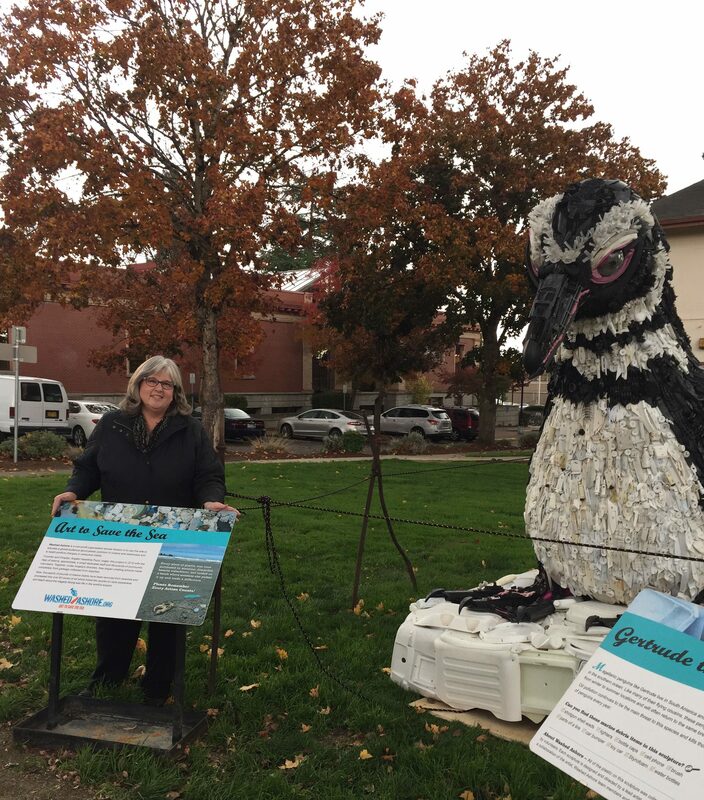 Past President Leah Griffith, below, stands near the sculpture, which represents a threatened species. All of the trash plastic making up this amazing penguin was collected from beaches by volunteers.